Dead fish on beach near Sarasota, Florida, killed by brevetoxins from 2018 red tide. Credit: Bob Currier, Texas A&M University. Pinellas County residents and visitors who are susceptible to the respiratory impacts of Florida’s red tide—especially people with asthma and other chronic lung diseases—now have a new tool that will help them know their risks before they visit area beaches during red tides. A new website now provides a risk level forecast for red tide respiratory impacts on each of Pinellas County‘s beaches. The 24-hour Experimental Red Tide Respiratory Forecasts are updated every three hours, following the collection and analysis of water samples. The forecast will typically be available on Tuesdays, Thursdays, Saturdays and Sundays. Human respiratory impacts happen when the Florida red tide organism, K. brevis, is present and winds blow onshore or alongshore. When red tide is in the air, most people experience minor respiratory irritation—coughing, sneezing, teary eyes and an itchy throat. These symptoms go away when they leave the beach. However, people with chronic lung problems like asthma and chronic obstructive pulmonary disease (COPD) can have severe reactions when they breathe in airborne red tide toxins—even ending up in the emergency room. Health officials advise that these people avoid red tide areas altogether and take all medications as prescribed, including having access to rescue inhalers. People with chronic lung disease should leave the beach if they begin experiencing respiratory problems, even if red tide is at very low or low concentrations. “Red tide blooms can be really variable because of wind patterns,” said Dr. Barbara Kirkpatrick, Executive Director of the Gulf of Mexico Coastal Ocean Observing System (GCOOS) and an environmental health scientist who conducted the first studies documenting the impacts of Florida red tide blooms on human health. This experimental forecast was developed by NOAA’s National Ocean Service in partnership with GCOOS, the Florida Fish and Wildlife Conservation Commission-Fish and Wildlife Research Institute (FWC-FWRI) and Pinellas County Environmental Management. The forecast was developed through funding from the NASA Health and Air Quality Program and is hosted by GCOOS. In 2004, the National Oceanic and Atmospheric Administration’s National Ocean Service (NOAA-NOS) and partners started issuing twice-weekly condition reports and bulletins that identified the risk of respiratory irritation for three-to-four-day periods on a county-by-county level. The information is now released through the National Weather Service’s regular Beach Hazard Statement alerts. This new Experimental Red Tide Respiratory Forecast builds on NOAA’s condition reports and bulletins by providing information at a finer scale with forecast for each beach in Pinellas County. The experimental forecast is being tested in Pinellas County because it rapidly developed a robust data collection system for red tide cell counts. 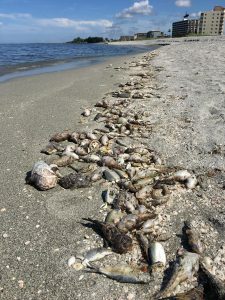 Pinellas County Environmental Management worked with FWRI to institute regular beach-level water testing multiple times a week and at additional sites to verify the presence of red tide at its beaches when the bloom began impacting its shores. This cell count data, combined with wind forecast information, is helping to verify the beach-level forecast models. Pinellas County staff take water samples on Mondays, Wednesdays, Fridays and Saturdays. On days when no water samples are collected, no forecast information can be provided. The blooms simply move around too much to make longer-term forecasts at this time. Absent/Very low: Meaning there is a low risk of irritation among most beach-goers but that people with lung disease should leave the area if they begin feeling impacts. Low: A low risk of irritation among most beach-goers but that people with lung disease should leave the area if they begin feeling impacts. Moderate: Moderate risk of irritation for most people; people with lung disease should avoid this area. High: High risk of irritation for most people; people with lung disease should avoid this area.